Welcome to the Model Makers and Collectors Association Inc. website. MMACA not only provides benefits for individual members, but extends an invitation to other groups with similar interests to affiliate and benefit from "umbrella" coverage. For details, click here. June 2016 : The 100th edition of the BMBG Model Boats Newsletter was their final however most previous copies are available in our archives here. The Galleries page has recently been updated with over 300 historical modelling photos from the private collection of our MMACA President - Brian Johnson. When viewing please remember that most of these photos were taken long before digital cameras existed, digital reproduction of small photos often leaves quality a bit lacking but they are still valuable archives. Seven new videos from various MMACA Exhibitions at the Derwent Entertainment Centre between 1993 & 2003 have been added to the Galleries page. More will be added as further footage is uncovered. The majority of this exhibition video coverage was filmed by Ian Simpson, a Model Train enthusiast, hence the slant towards that side of the shows. Great historical coverage none the less and definitely worth a look. All YouTube links are now dynamic and update in real time so as soon as a host site updates a video & adds it to a specific play list it appears in our Gallery. The result of this is a huge amount of new content that is easy to select for your viewing pleasure. If any member clubs that have YouTube channels displaying their club activities and would like them included in our Galleries section please contact the WebMaster . We need YOUR help to make it happen. Come on guys & gals, here is the perfect opportunity to promote your club and its activities, all we need is a link to your latest video exploits & a few words to go along with it. The 2016 BRMA – Southern TAS Model Train Show continues to go from success to success. The organisers for 2016 were the Pope family and what a good job they did. I’m stepping down from being the organizer to just a helper so I kept in touch with the Popes to try and smooth out the transition and I think that worked fairly well. Everyone including the Glenorchy Lions Club and the Tas. Transport Museum reported smooth sailing. With a new programmable cash register courtesy of the Transport Museum our gate figures are considerable more accurate and just on 4000 people went through the gate. Our final figure will never be exact because we are very flexible on family figures. Theoretically it is 2 + 2 but we will often not charge for really little kids or only part charge for a family of 2 + 4 or 5. We believe the public appreciate this approach and in part that’s why they keep coming in such numbers. This year saw several new layouts not seen before and in particular Gordon Brown and his crew from Melbourne with his layout “Eyarth”. Not only was “Eyarth” different but the attitude of Gordon’s team in getting kids involved to run the layout was very much in our ethos. The winner of the inaugural John Mayo Trophy for the best layout as judged by Kristie Johnson (Mayor of Glenorchy) and Craig Farrell (MLC) was Rushy Creek built and operated by John Fielding and helpers. John has been a regular entrant over many years and when not an entrant volunteers his time to the organizing committee. Numbers entering the “A4” diorama competition are still low and I believe this part of the show will have to be reviewed but the entries remain very high quality. BRMA – Southern Tas Area representative. 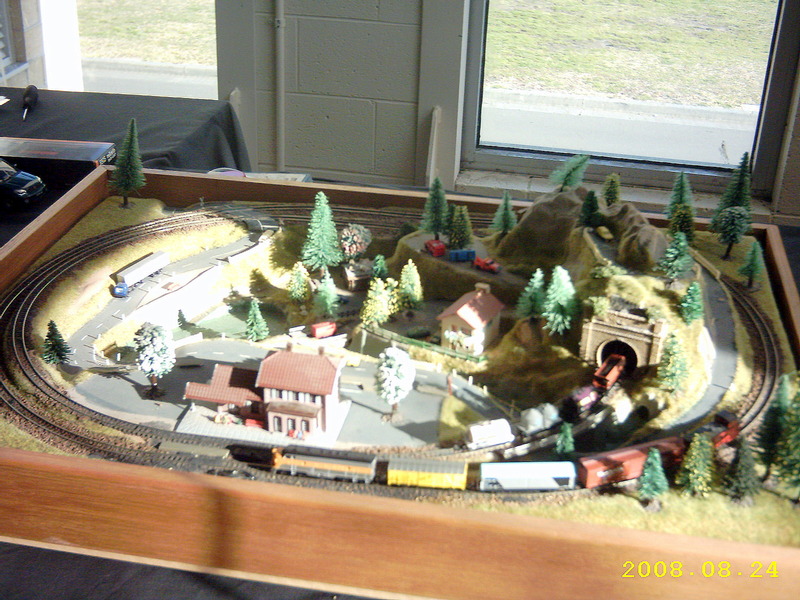 The Model Train Show has continued to be held every year (last reported on this website in 2008 due to website editing issues) and has always raised considerable funds for the Glenorchy Lions Club Charities. The total is now well in excess of $50,000.00. The Model Train Show continued to be held at the Hobart Show Ground until 2013 where due to an error on the part of the Show Society with our booking we were forced to quickly find another location to run the event. One of the BRMA members (David Beck) suggested the possibility of the Transport Museum in Glenorchy and when it was realised that they had recently built a new building with funds granted by the Federal Government of the day we had solved our problem. While the actual total space was less than the Show Ground it gave us the opportunity to put on the Model Train Show and have real trains, both Steam and Diesel, running and providing rides for the public at the same time. The one ticket price covered all and the public obviously thought it was great as they attended in large numbers. The Model Train Show has been held there ever since and we anticipate it remaining there for the foreseeable future. The event has been moved to August and now for the convenience of parking is held on the weekend where there is no State AFL game being played on the adjacent King George V oval. The 2015 event was probably the best yet with 22 working layouts ranging in gauge from “N” to “G” and a static live steam display plus a “OO” gauge entry from Victoria. While our patron counter system let us down we estimate three thousand people streamed through the entrance keeping those on the counter very busy all of both days. The committee has changed due to both age and new involvement and now consists of representatives from the BRMA - Tas, Glenorchy Lions Club and the Tasmanian Transport Museum Society Inc.
A total of $10,600 was raised for charity! 22nd September 2015: The Model Makers and Collectors Association Exhibition scheduled for March 2012 never happened for several reasons. To read more click here. MMACA is working to develop a unique model park at Goodwood in Hobart's northern suburbs. The first stage, involving clubrooms and two model car tracks, has been completed. To view story of how it came to be click here. A plan of how the finished park will look and a map showing how to get there are also on the Model Park page. The Boulder Creek Tramway is a 7¼" (184mm) gauge miniature bush railway that is currently under construction at Howden, approximately 15 minutes south of Hobart in Tasmania. For more information and to follow the progress of construction click here.